What other skills do you need for professional development as a PHP programmer? You study object-oriented programming principles, use Git in all your projects, and know your code inside and out. What comes next? This anthology collects articles first published in php[architect] magazine. Touching on topics in professional development, each one will give you advice on the soft, non-technical skills you should cultivate. A successful, long-term career in software development depends on much more than knowing the PHP manual by heart. Make sure you’re prepared for the next step. An overview of the skills and practices to keep your knowledge up to date. How the PHP Community and Open Source can sharpen your skills. Recognizing and avoiding Burnout in you and your coworkers. Defining the responsibilities of a Senior Developer role. Getting the most out of Conferences and why your team should be attending one. Becoming a speaker to share what you learn from getting over a fear of public speaking to crafting your next talk proposal. Advice on starting your own local user group. Handling scope changes and bug reports effectively. What is meant by product management and how to transition into it. The pros and cons of freelancing versus being a founder. Preparing a resume which resonates with employers and recruiters. 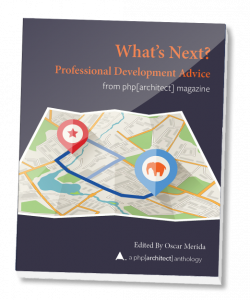 Each month in php[architect] magazine, experts from the PHP community and wider web development community share their knowledge and experience with our readers.